Our programs offer access to outstanding facilities in an unrivalled natural environment, as well as the opportunity to interact with professional artists from around the world working in a variety of mediums and disciplines. Experimentation and collaboration across media is encouraged, and the use of facilities in areas outside of Visual Arts can often be negotiated, as we are committed to assisting artists in the realization of their creative goals. Visual Arts facilities are located in Glyde Hall and are available to artists participating in our programs. Facilities support artistic production in analogue and digital photography, sculpture, printmaking, paper-making, ceramics, fibre, painting, drawing, digital media, video, and sound. Our knowledgeable staff are practicing artists themselves and can help facilitate your projects and provide technical support. Please see our Facilities Fees Booklet for facility policies and guidelines, associated fees, and more information. Artist Sandrine Schaefer's studio during the Banff Research in Culture residency, 2017. Visual Arts studio spaces are located in Glyde Hall. Most studios have natural light and walls averaging 6 metres (20 feet) wide by 3.6 metres (12 feet) high, offering the possibility for large scale work. Studios are assigned by the department based on your project media, and resource availability. 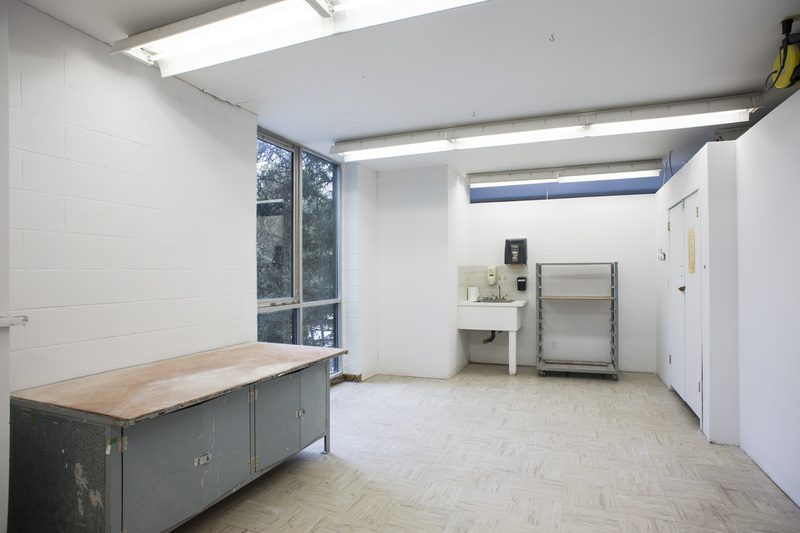 Office-style studio spaces are available in the Jean and Peter Lougheed building. 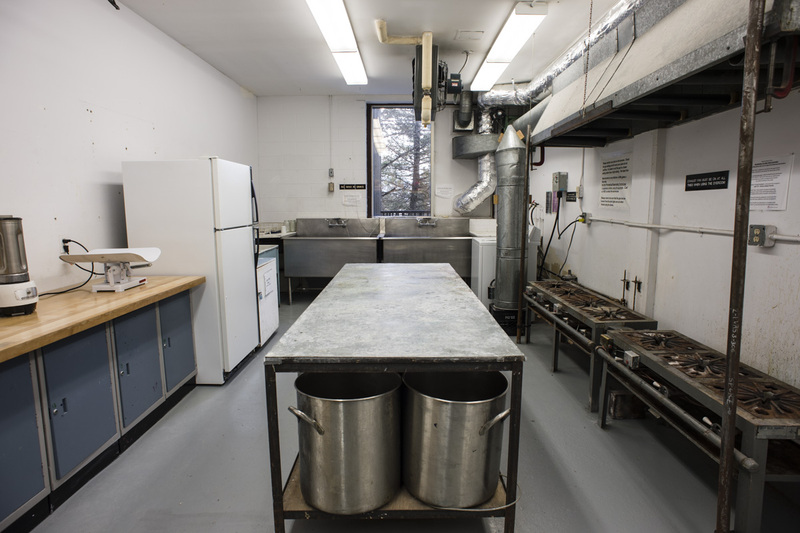 Located in a wooded area on Banff Centre campus, the Leighton Artists Studios inspires and accommodates creative practice. With its serene forest views and thoughtfully designed interiors, the studios offer an intense and stimulating environment; a location free from distraction; an ideal space for creativity and intense productivity. 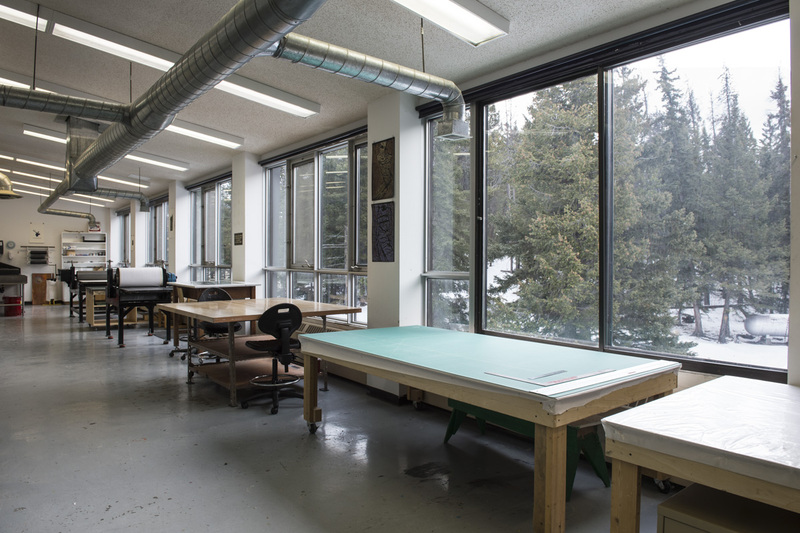 The Leighton Artists Studios offer artists the ability to delve into their work as a solitary retreat, as well as the option to engage within the larger artistic community of Banff Centre. Artists wishing to use a Leighton Studio must apply to the studios directly. The Project Space is a 36-square-metre (400-square-foot) multipurpose room used for experimentation, informal presentation of work, and Walter Phillips Gallery educational activities. Available to participants in Visual Arts residencies, the room provides an opportunity for artists to install their work for documentation and to gain peer feedback. The Project Space is located on the second level of Glyde Hall. Electric kilns and sand blaster in the ceramics facilities. Image credit: Rita Taylor. The Ceramics Studio offers an exceptional opportunity to explore new directions in your work in the company of like-minded peers from around the world. 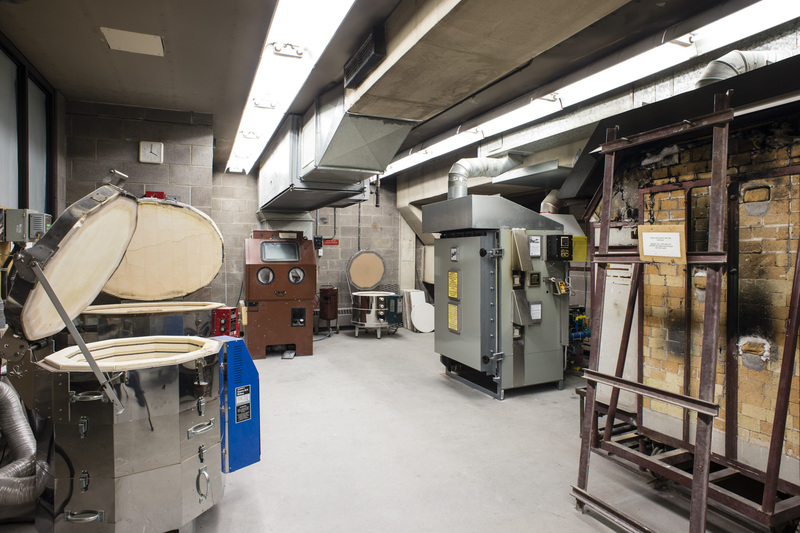 Artist share access to a broad range of equipment designed to support most aspects of contemporary ceramic practice including: electric, gas, soda/salt, wood and raku kilns, wheels, extruders, a plaster room, and a well-stocked glaze room. Large individual studios are accessible 24 hours a day, enabling artists to indulge in their own work in response to the overall flow of residency activity. 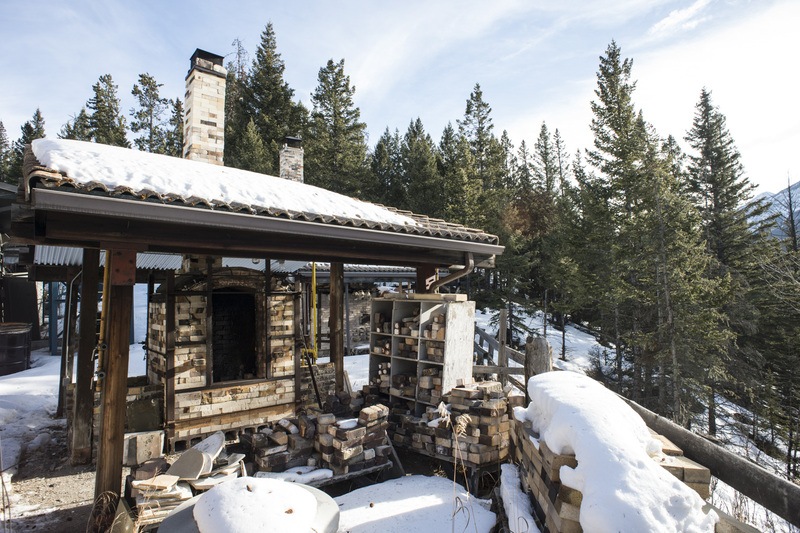 The experience of working in our ceramics studio is organic; a product of experimentation, discussion, collaboration, trial and error, and exposure to a host of different stimuli — not least of which is the inspiration provided by the beautiful Rocky Mountains. Digital scanners, large format archival inkjet printers. Image credit: Rita Taylor. 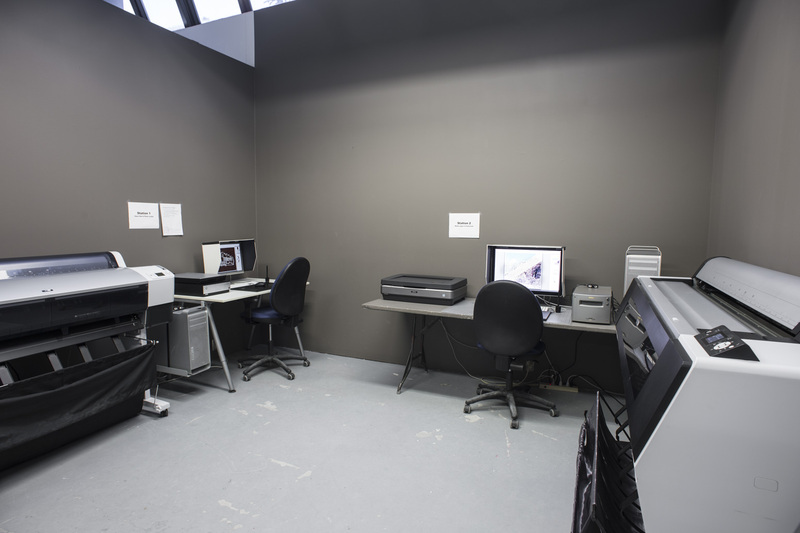 The Digital Imaging Studio features two 44” Epson wide-format inkjet printers. A variety of fine art papers are available to artists, including, matte, lustre, and silk finishes, as well as output onto clear film for photo processes in printmaking and photography. High resolution scans can be made from negatives and slides using our Nikon 9000, or Epson V750 Pro film scanners. Additionally, reflective scans up to 11x17” are possible on the Epson 10000XL flatbed scanner. Our two professional workstations include the Adobe Creative Cloud Suite, and tablets for advanced editing capabilities. Artists working in this facility have complete creative control over their projects, and are encouraged to have a foundational knowledge of image processing. The photography and printmaking facilitators, as well as practicum participants in these areas, are available to answer any questions and help artists make the most of their experience. Banff Centre Visual Arts studio. The Drawing and Painting Studios provide space to produce new work in the mediums of drawing and painting (oil, acrylic, and water colour). Artists-in-residence are provided a secure private studio accessible 24 hours, seven days a week. Studios are spacious to accommodate large scale work with skylights to provide natural light. Work tables, easels, and basic studio furniture is provided. Plein-air painting is possible within Banff National Park during the summer and fall months. 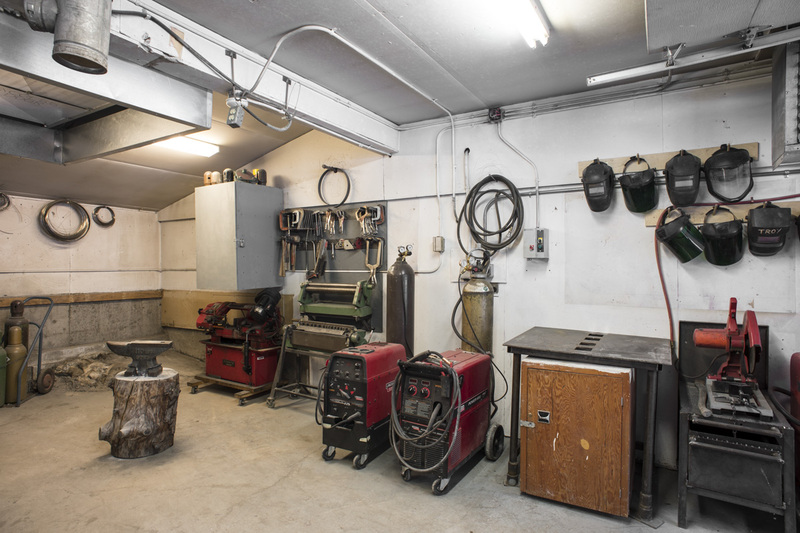 Artists have access to the sculpture studio which is equipped with stationary and portable power tools for the construction of stretchers and other supports. 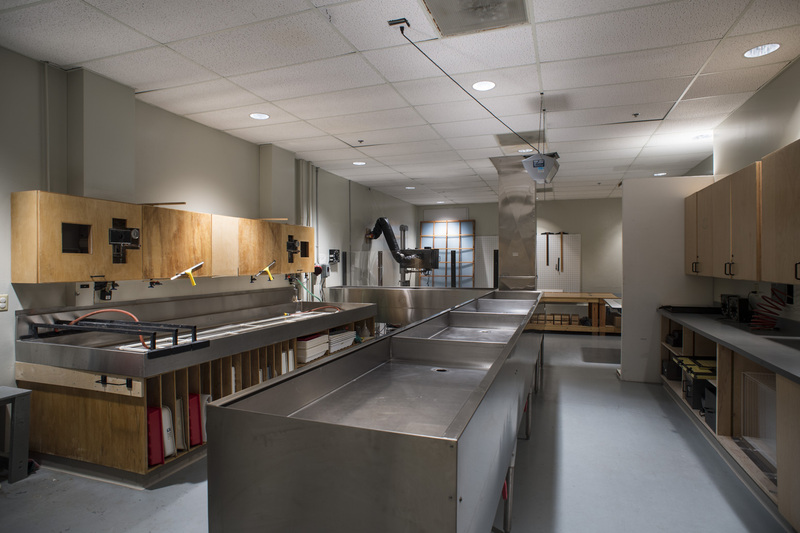 A spray booth is also available in the sculpture facility for fixatives, spray paints, and other noxious materials. Artists can ship or bring their art materials to Banff or order materials from the closest city, Calgary (1.5 hours by car). A.W.T Seri-glide with a one-arm squeegee assembly for printing images up to 30x40” (right), and an A.W.T Accu-glide table for manual printing (left). Image credit: Rita Taylor. 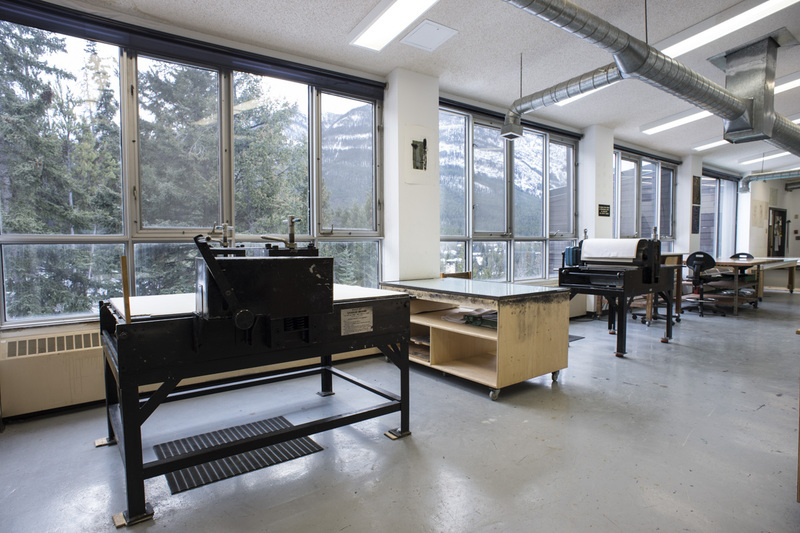 The Printmaking Studio is filled with natural light and offers a spectacular view of Rundle and Sulphur mountains. 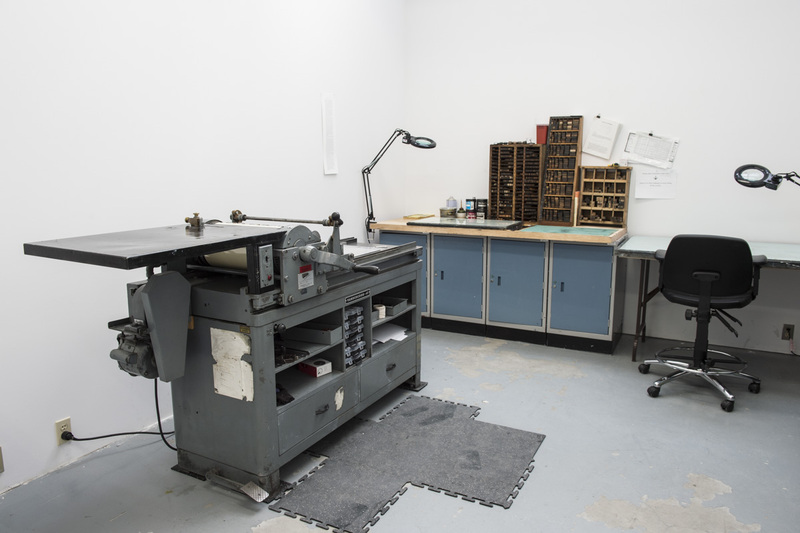 The studio is available 24 hours a day and is fully equipped for water-based screen printing, etching, and relief printing, photopolymer platemaking for letterpress, typography, and lithography. Artists can output images on clear film for photo-processes as well as produce archival full colour inkjet prints on digital fine art paper in the Digital Imaging Studio. 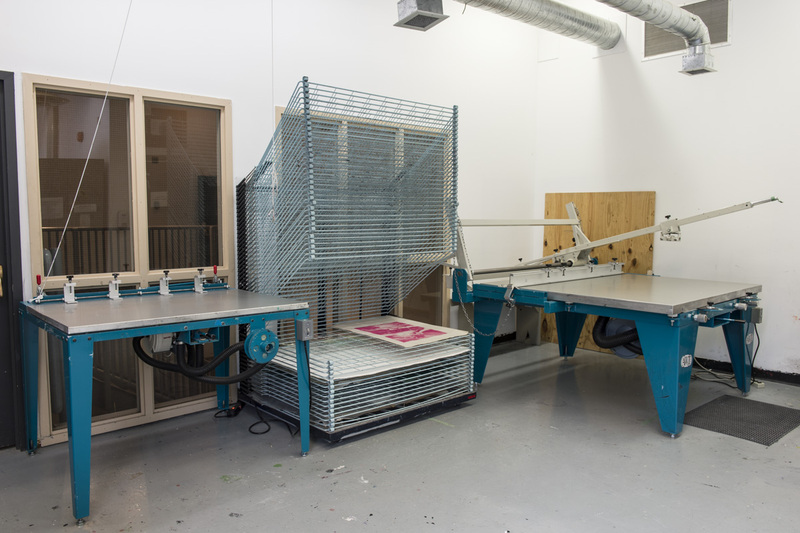 The Printmaking Studio houses two Charles Brand etching presses with bed sizes 26x48” and 36x60”. Two screen-printing vacuum tables are available; an A.W.T Seri-glide with a one-arm squeegee assembly for printing images up to 30x40”, and an A.W.T Accu-glide table for manual printing. For photo-printmaking, artists have access to a NuArc Tri-light exposure unit (max 42x52”). 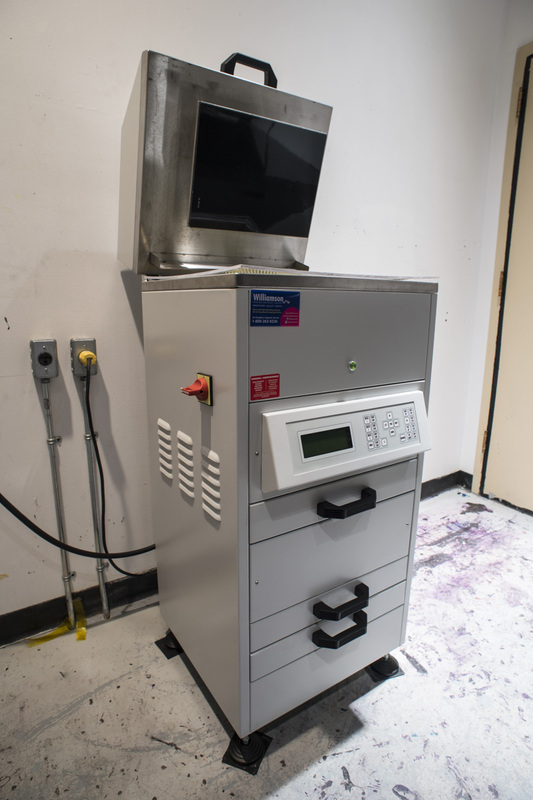 The Lithography Studio is a complete self-enclosed ventilated studio with a Griffin Lithography press for stone, traditional plate, and photo lithography. Typography houses a Vandercook 4T Proofing Press (maximum size 14x17”) to print polymer plates and offers a variety of metal type. The Heights (UK) Waterpress Platemaker is available for photopolymer platemaking up to 10x14”. 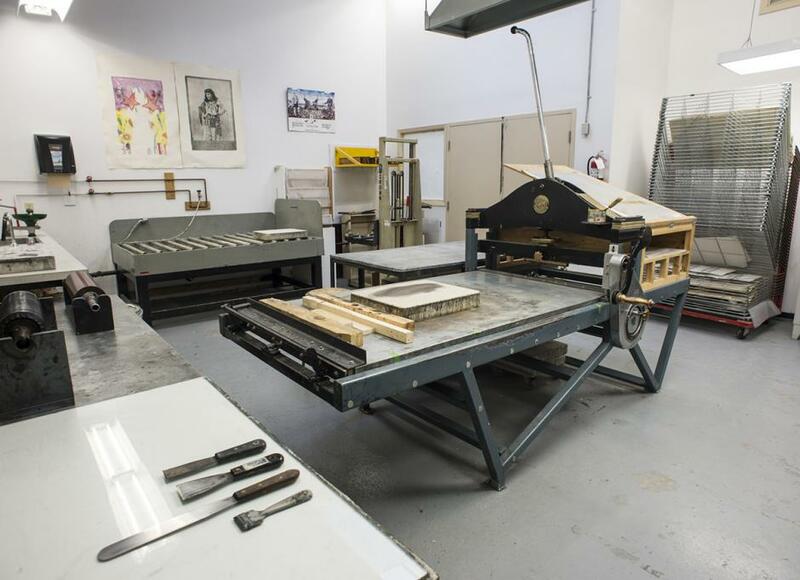 Printmaking facilities provide essential equipment such as a spray-out booth, screens and squeegees, acid room with Ferric Chloride trays, aquatint rosin box (maximum 18x24” plates), paper soaking sink (maximum 36x55"), down-draft table, hot plate, rollers, and brayers. Papermaking studio including 32x42” Dake 25T hydraulic press. Image credit: Rita Taylor. The Papermaking, Textile, and Fibre Studio is built on the exposed natural rock face of Sleeping Buffalo Mountain. With beautiful views and easy access to the outdoors, the studio is a retreat-like environment for these practices. 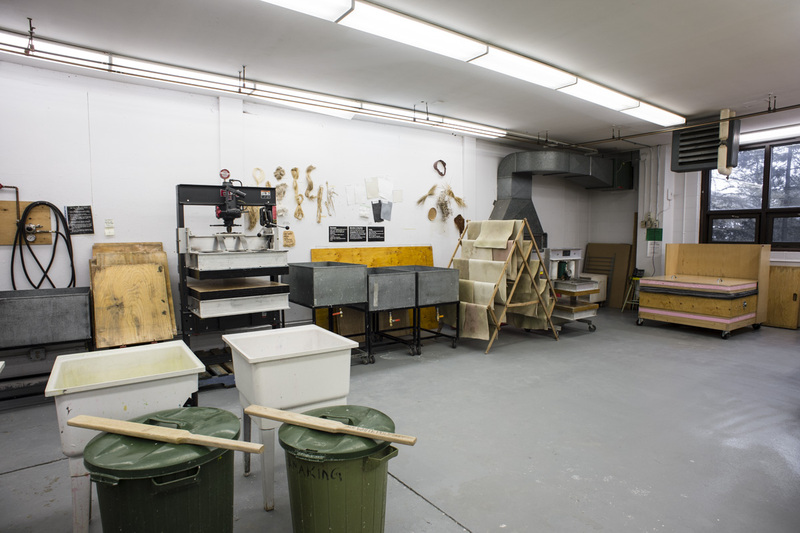 The Papermaking Studio is fully equipped for pulp and paper production and experimentation in contemporary paper art forms. Equipment includes a David Reina Hollander beater (max 1lb) and two presses to assist with sheet formation: a 25-tonne Dake hand-operated hydraulic pump with 32x42”bed, and a Howard Clark 22x30” 20-tonne press. A Lee S. McDonald Santa Ana professional paper dryer (fan operated) is used for sheet drying. Neighbouring facilities are available for mold-making and casting. Basic equipment for papermaking is provided such as a variety of molds and deckles, felts, vats, stainless steel pots, studio lift, pulp sprayer with compressed air, strainers, and refrigerator. The adjoining dye facility contains gas burners and ventilation for textile dyeing and fibre processing. 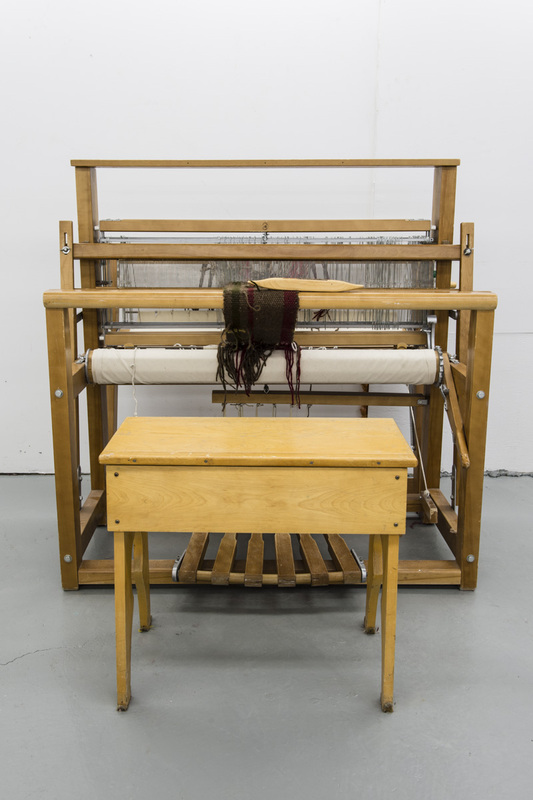 A 4x8' padded textile table is used for printing and hand dying fabric, and a Leclerc loom is available. 24-hour studio access is provided to artists-in-residence. Our Photography Studio is a professional facility made up of eight darkrooms, a print-finishing area, and a lighting studio. The facility supports a variety of analogue and digital photography projects and allows artists 24-hour access. The Lighting Studio is equipped with electronic strobes, tungsten, and LED lights. Traditional projects can be carried out using four black and white darkrooms (up to 20x24"), three colour darkrooms (up to 30x40"), and a mural printing darkroom (up to 42x60"). Additionally, artists have access to a range of camera equipment including Nikon DSLR cameras, a Canon C100 video camera, as well as a Hasselblad medium format, and Cambo large format camera. Digital output up to 44” in width is possible in our Digital Imaging Studio. Larger output (up to 60” wide) as well as black and white and C-41 film processing, is available through Photographic Services. 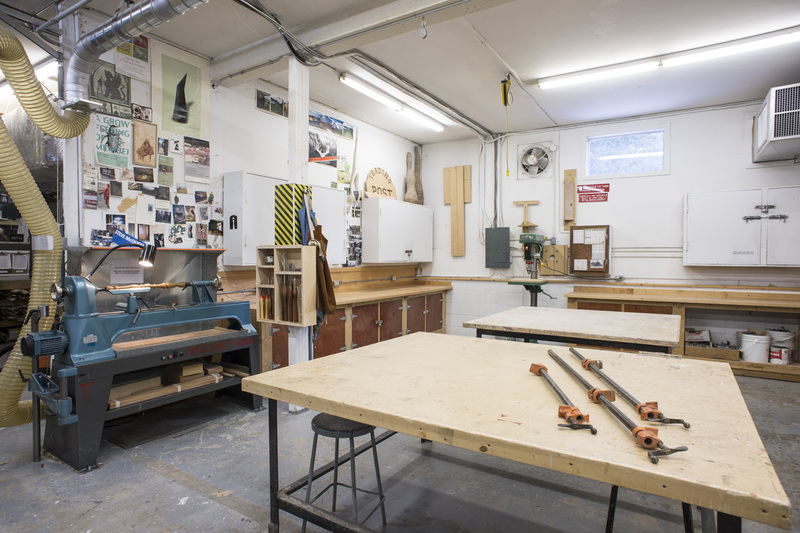 The Sculpture Studio provides artists-in-residence with an shared environment for the exploration of three-dimensional projects. 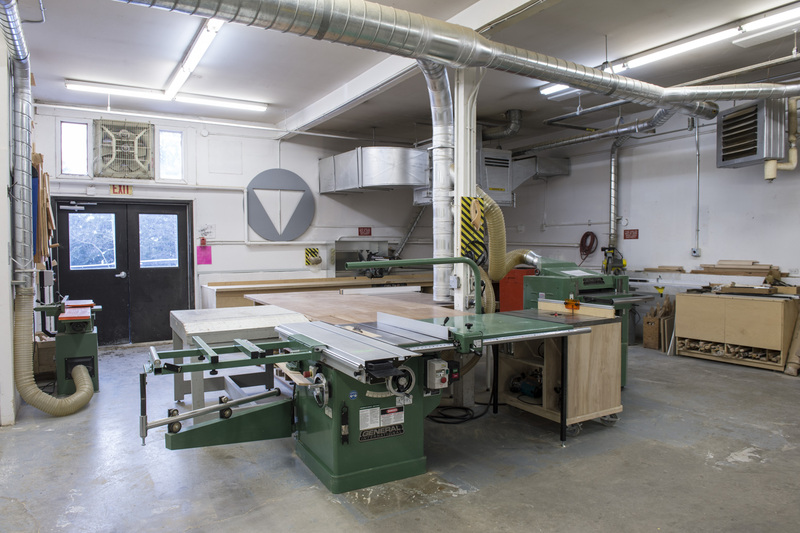 Artists have access to world-class equipment for wood-working, metal-working, mold-making, and more. Our studio facilitators are experienced and knowledgeable practicing artists who can support and trouble-shoot projects that are highly exploratory, experimental, cross disciplinary, or based in traditional materials, and processes. Together we can make your sculpture dreams come true. Replicator-2 3D printer; Mac & Windows computers for video, audio, and computational media; electronics prototyping tools; controlled lighting for projection. Image credit: Rita Taylor. 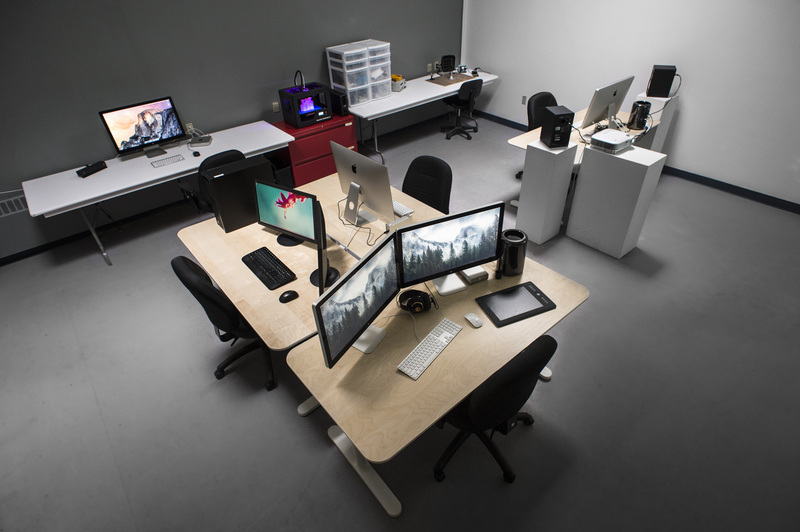 The Digital Media Studio offers facilities and equipment for artists creating works with video, audio, animation, interactive media, physical computing, and digital fabrication. 24-hour access is provided to participants enrolled in visual art residency programs. Artists requiring guidance or technical assistance are welcome to arrange one-on-one support by contacting the digital facilitator. This space may be used by multiple artists for various purposes at once, and also for solo exploration. 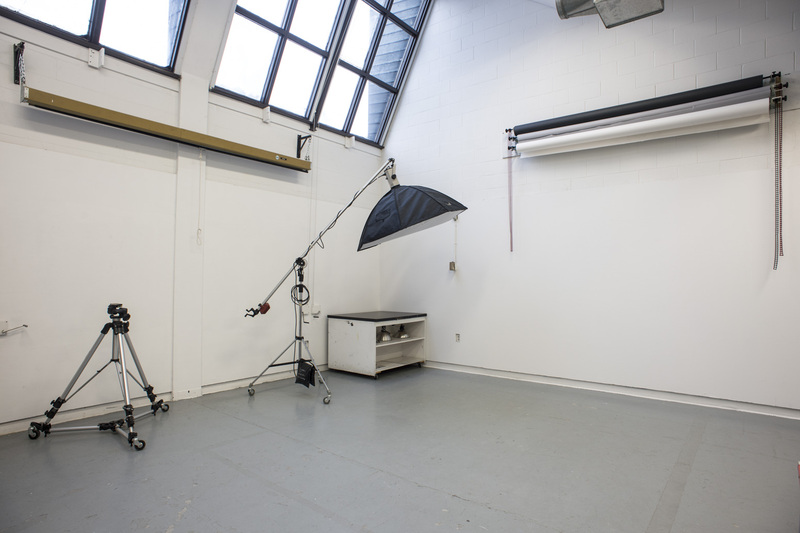 The 19x24’ studio can be re-configured to accommodate the particular needs of current artists-in-residence. As many of our individual artist studios are filled with natural lighting, this studio is equipped with two walls painted with projection screen paint, offering a space for projection experimentation that can be completely darkened. Computer workstations offer many common software applications for video, audio, 3D and 2D animation, and programming for both Mac and Windows environments. As artists may prefer working with their personal equipment, we also provide an array of supplemental equipment and supplies to enhance their individual studio work spaces. The Gerin-Lajoie Studio in the Leighton Artists Studios. For more on the Leighton Artists Studios for independent residencies, please click here. Artist Studio on the Ceramics Level of Glyde Hall. Image credit: Rita Taylor. Lathe and work stations. Image credit: Rita Taylor. Charles Brand etching presses with bed sizes 26x48” and 36x60”. Image credit: Rita Taylor. Main printmaking studio space. Image credit: Rita Taylor. Heights (UK) Waterpress Platemaker for photopolymer platemaking up to 10x14”. Image credit: Rita Taylor. Vandercook 4T Proofing Press (max size 14x17”), variety of wood and metal type. Image credit: Rita Taylor. Contains gas stoves with exhaust ventilation, a washing machine, two 4' stainless steel sinks, and a set of smaller fibreglass sinks. Image credit: Rita Taylor. Leclerc brand, Nilus, 36” 4-shaft jack-type, Floor Loom. Practicum positions offer hands-on experience with tools, techniques and our world-renowned faculty at the Walter Phillips Gallery. Read on to learn about the Visual Arts practicum experience.